They are a mixture of 3 different mines. Kingman,Royston and Pilot mountain. For Sale is a LOT of 9 Turquoise cabbed Stones Natural color. Mixed blue and green. These stones have been stabilized for Hardness only. This LOT IS 20. LET YOUR IMAGINATION RUN WILD. 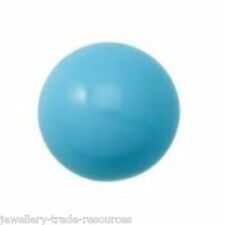 Blue Turquoise Tumble Polished Nugget Stone. Bead Size: 23x15x7mm Specific Gravity: 2.4-2.9. Because Turquoise is porous in its natural state, most stones are stabilized. This hardens it & makes the natural color permanent.it's a good thing! 11 Cts Blue Sleeping Beauty Turquoise Stone. AA Natural Turquoise Cabochon Pendant. Ny6designs is well known for its huge selections of Turquoise in North Texas and online; we have over 100 selections of Turquoise round beads and cabochons as well as finished Turquoise jewelry. LET YOUR IMAGINATION RUN WILD. this LOT IS 10. SKU/Product ID:QCCM2. GemType: Turquoise Cabochon, Cloud Mountain. The Gem Federated Group. WITH MINERAL COLLECTION IDENTIFICATION DOCKET MF9729. WEIGHT : TOTAL 16g. NATURAL MINED ARTISAN TREATED FOR STABILIZING. Carats- 54.5 Carats. A Natural Number Eight #8 Turquoise Cab from the OLD Number Eight mine in Carlin Nevada. The Lander County #8 Mine was depleted in 1961, and has been closed for over 45 Years. 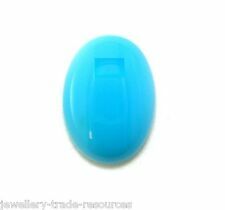 MORENCI TURQUOISE FINE PRE POLISHED LARGE CABOCHON NUGGET. Rare very high grade Morenci Arizona Turquoise. Cabochon Nugget. Excellent Multi Colored Patterns Exquisite Multi Blue Turquoise. 6-7mm Nuggets. with beautiful pyrite inclusions. Carats- 14 Carats. A Natural Number Eight #8 Turquoise Cab from the OLD Number Eight mine in Carlin Nevada. The Lander County #8 Mine was depleted in 1961, and has been closed for over 45 Years. make Supersized seem small. Carats- 12.5 Carats. A Natural Number Eight #8 Turquoise Cab from the OLD Number Eight mine in Carlin Nevada. The Lander County #8 Mine was depleted in 1961, and has been closed for over 45 Years. 30.00 Cts. (TGW) ~ Turquoise Earrings. The above blue turquoise gemstones and accents are fashioned into the earrings as follows: Each earring contains a solitaire 12.00 Mm. blue turquoise gemstone on the bottom. The spider-webbing is often very fine and tight. Other stones available, sold separate. Carats- 70.5 Carats. 日本 へ の 自由な 船積み. 195.00 Cts. (TGW) ~ Turquoise Necklace. The above blue turquoise gemstones and accents are fashioned into the necklace as follows: When positioned around the neck as shown in the main picture above, the necklace has a lower quadrant consisting of a solitaire 14.25 Mm. Bead Size: 28x18x7mm Specific Gravity: 2.4-2.9. Because Turquoise is porous in its natural state, most stones are stabilized. This hardens it & makes the natural color permanent.it's a good thing! Carats- 20.5 Carats. A Natural Number Eight #8 Turquoise Cab from the OLD Number Eight mine in Carlin Nevada. The Lander County #8 Mine was depleted in 1961, and has been closed for over 45 Years. Other stones available, sold separate. The spider-webbing is often very fine and tight. Other stones available, sold separate. Carats- 13 Carats. 日本 へ の 自由な 船積み. Campitos Turquoise. 3mm Rondells. Stabilized-no color or dye added. Size: 44x22x6mm. SKU/Product ID:QCCM1. GemType:Turquoise Cabochon, CLOUD MOUNTAIN. Transparency: Opaque. Modified: No. The spider-webbing is often very fine and tight. Other stones available, sold separate. Carats- 18 Carats. 日本 へ の 自由な 船積み. 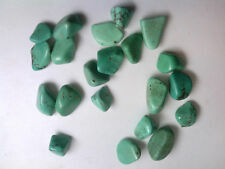 These are nice blue color thunder mountain (Nevada) natural turquoise cabochons. I bought these cabochons at Tucson gem show 2 years ago. 3 cabochons 18 ct total. Carats- 15.4 Carats. A Natural Number Eight #8 Turquoise Cab from the OLD Number Eight mine in Carlin Nevada. The Lander County #8 Mine was depleted in 1961, and has been closed for over 45 Years. Other stones available, sold separate. These are stabilized unbacked natural turquoise cabochons. 9 cabochons 31 ct total. I am also a jeweler so I know what is the good shape of cabochon for bezel setting. Various size to make such as earrings or rings. Carats- 16.4 Carats. A Natural Number Eight #8 Turquoise Cab from the OLD Number Eight mine in Carlin Nevada. The Lander County #8 Mine was depleted in 1961, and has been closed for over 45 Years. Other stones available, sold separate. Bead Size: 18x11x4mm Specific Gravity: 2.4-2.9. Because Turquoise is porous in its natural state, most stones are stabilized. This hardens it & makes the natural color permanent.it's a good thing! Because Turquoise is porous in its natural state, most stones are stabilized. This hardens it & makes the natural color permanent.it's a good thing! The natural color is permanent. The surface of the turquoise has been polished. 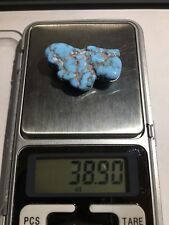 Kingman turquoise lapidary free form shaped cabochon. This stone is a hydrated aluminum copper phosphate that often contains iron. Turquoise is considered a stone of wholeness, promoting the sense of unity of the self and oneness with all that surrounds us. Campitos Turquoise. 3mm Rounds. Stabilized-no color or dye added. Chinese turquoise lapidary freeform shaped cabachon. This stone is a hydrated aluminum copper phosphate that often contains iron. It occurs naturally in shades ranging from sky blue to grey-green, usually in locations where copper is hidden in the soil in high concentrations. Carats- 26 Carats. A Natural Number Eight #8 Turquoise Cab from the OLD Number Eight mine in Carlin Nevada. The Lander County #8 Mine was depleted in 1961, and has been closed for over 45 Years. Other stones available, sold separate. A Collection of Natural Number Eight #8 Turquoise Cabs from the OLD Number Eight mine in Carlin Nevada. The Lander County #8 Mine was depleted in 1961, and has been closed for over 45 Years. Source- Carlin, Nevada, Lander County, USA. 10x6x4mm Nuggets. with beautiful pyrite inclusions.